It's like a knit club where we'll talk about knitting, properties of knitting. Without the sad or demented part. 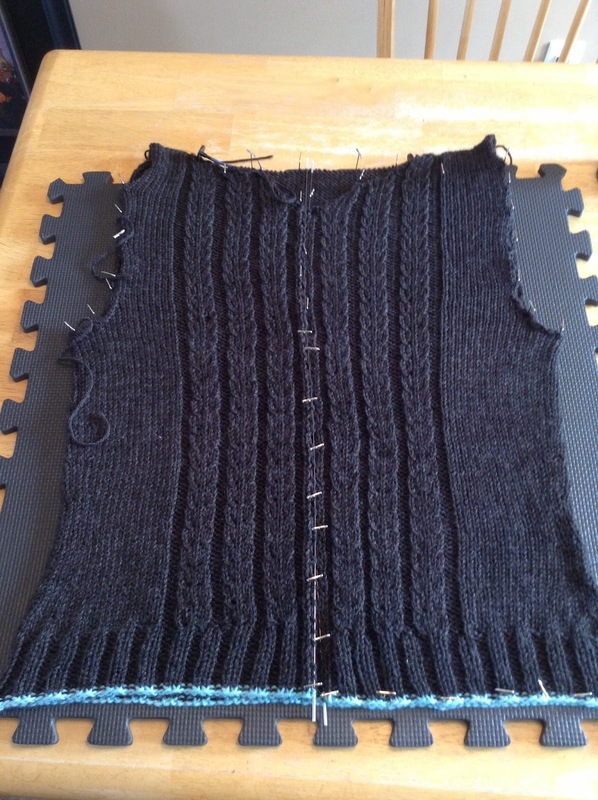 The body of this sweater went together quite quickly. I actually knit all of this in less than 2 weeks. I was starting to think that I could be one of those knitters that slams out a whole adult sized sweater in less than a month. 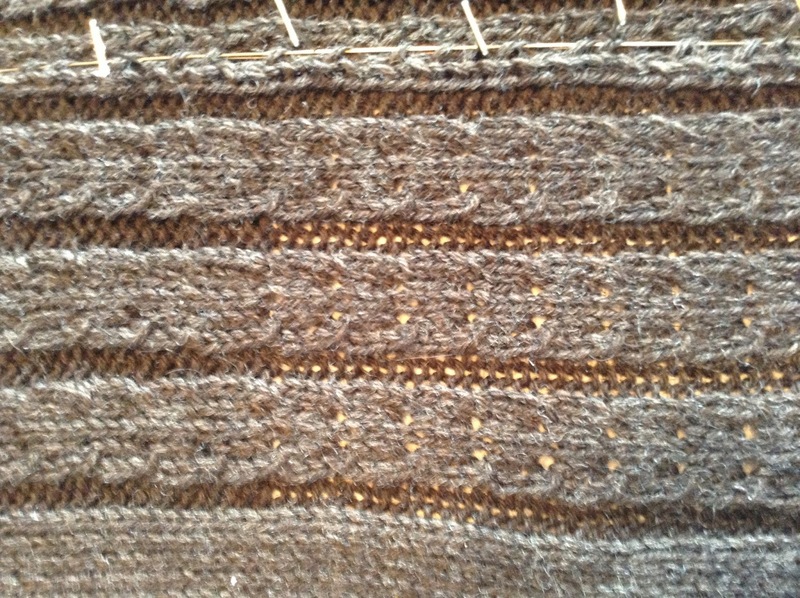 (Provided I use worsted weight wool, larger needles and have a lot of time to sit and knit.) I looked at this body and thought to myself that I had only 2 sleeves and a button band and collar left to go! Oh baby, home stretch! Right? Right? So why didn't I continue on my hot streak and just finish? Because something wasn't right. But I couldn't quite put my finger on it right away. I started looking at my sweater and comparing it to those Ravelry completed by other knitters. I liked theirs better but could not figure out why mine seemed... lacking. Was it the colour or yarn? No, I still liked both. Although I was a little nervous now about this yarn pilling under the arms after having read some reviews. I was concerned but it wasn't a deal breaker. Was it the waist shaping? No, I don't think so. I ultimately decide to put in waist shaping despite the knowledge that my own shape has none. I figured that it really was slight shaping and maybe it would help me look like I have a shape. No big deal. It was the cables. Specifically the yarn overs. Look at the pictures at the very top of this blog. Her sweater has beautiful cables with big open peeky holes. Mine have to be stretched to be seen. 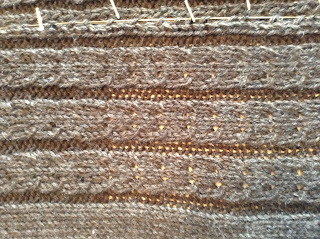 EXCEPT over a couple of rows, notably the left breast, where I must have forgotten what I was doing and completed a proper yarn over, completely by accident. Crap. so that you can see how open my yarn over are NOT! So, what do I do now? Well, I am blocking it now but shy of physically opening and stretching each yarn over individually they are going to stay as they are right now. The cables still look nice but just not as I had wanted them to look. As I have discussed time and time again I am a process knitter and, as such, I really do not see myself ripping this whole sweater to start again. And if I am not prepared to rip it back then I have to be happy with it as it is now. But in my mind it isn't the same sweater. ARGG! Please leave me a comment to tell me what YOU would do? In the mean time, I think I may take this an oppotunity to start a new sweater... while the jury is out. THINGS I CAN DO: parent, read, knit, do yoga, work, volunteer, pick things up with my toes, be a friend, have opinions about stuff that is totally not my business and read minds. THINGS I CAN'T DO: whistle, sing in rounds, tell a joke properly without reading it directly off a piece of paper, sneeze less than 7 times or read YOUR mind. Um, I slipped? So much for destashing.